Everyone wants to do the very best they can for their children. 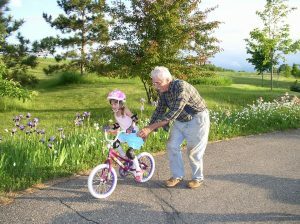 It may be, however, that grandparents are in the strongest position to help when it comes to finances. Over the past few weeks we have looked into tax planning opportunities to reduce the liability for both personal and business tax. This week we will explore some of the ways in which grandparents can help out their grandchildren whilst potentially lowering their own tax liability. Some of the basic options are really simple. Every individual can make a £3,000 gift each year, free from inheritance tax, for instance. This won’t form part of the sums considered for the seven-year exclusion period usually applied to gifts prior to a donor’s death. Contributions to Junior ISAs might be something to consider. And pension contributions to a scheme for a grandchild can be very efficient too. For a £2,880 contribution, the tax relief is 20% meaning that the government tops up to a gross figure of £3,600 – the maximum on which a non-earner can gain relief. And this can be doubled if both grandparents are able to make the maximum contributions. Discretionary Family Trusts can seem a little more obscure and off-putting, but are well worth discussing with your accountant. If a parent sets up a trust, it is deemed to be ‘settlor-interested’ and all of the income is treated as belonging to the parents and taxed accordingly. This issue doesn’t arise if we’re talking about grandparents. You might choose to help with school fees or create a pot of money that can be used for university. Each grandparent can transfer in up to £325k in cash or assets not covered by other inheritance tax relief. Anything above this figure is subject to lifetime inheritance tax at 20%. As discussed above, assets such as cash may be transferred into trust with no immediate tax implications, subject to the £325k per person limit. If, however, the grandparents hold shares in a trading company, subject to certain conditions including period of ownership, the shares will qualify for 100% IHT relief. Shares of unlimited value may therefore be transferred into a trust with no IHT liability. Capital Gains Tax may be due on the disposal of shares into the trust, but this can be deferred or “held over” until such time as the shares are sold or passed out to a beneficiary (although again, it may be possible to hold over the liability on such a transfer). Essentially, the deferral is until such time as there has been a real gain. The tax is levied on the difference in market value at sale and the original base cost of the shares. If grandparents hold shares in a company, take a dividend and use this to fund, say, school fees, they pay tax at their marginal rate. The net income then goes to the child. If, however, you use a trust instead, you can appoint an interest over the trust assets to the child. Any dividends are treated as the child’s income and when you combine the £2,000 dividend tax-free threshold with the £12,500 personal allowance from April 2019, the child can benefit from up to £14.5k tax free. Of course, it is possible to set up trusts for reasons unrelated to tax. Trustees retain control and are responsible for the trust’s day-to-day running. Assets are ring-fenced and the trustees decide who is going to benefit and when. They help their own inheritance tax position without adversely affecting anyone else. What’s more, grandchildren can be protected from the demands of future spouses or creditors. It’s a complex area, so if you’re interested in finding out more, the first step is to sit down with your accountant and talk through the options. But as a grandparent, you may be in a unique position to help your family. Contact us if you would like to discuss these tax planning opportunities further. Over the past few weeks we have run a series of blogs on tax planning opportunities in the run up to the end of the financial year. To read previous blogs click here.